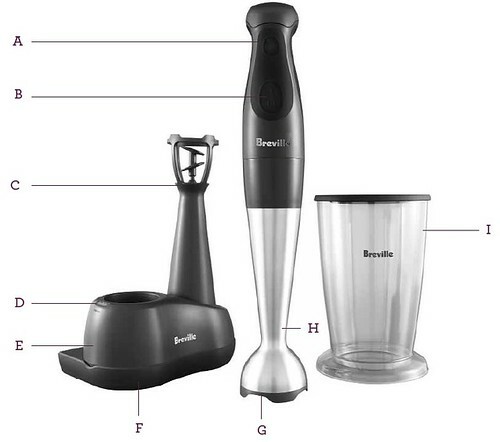 The Breville® Cordless 12V Stick Blender – With Quad-Fin technology and a powerful 12V rechargeable battery, this cordless blender can mix just about anything, just about anywhere. A. Safety System. Both 'POWER' & 'SPEED' buttons must be depressed to operate. B. 2 Speed Push Button Control. C. Smoothie Attachment. D. Charge Light (Red for charging, Green for charged). E. 360° Charging Base. F. Optional Wall Mount. G. Stainless Steel Ice-Crushing Blades. 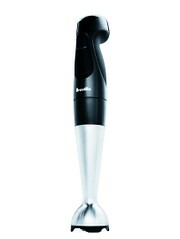 H. Detachable Shaft. I. 34 oz (1 Liter) Mixing Jug with Storage Lid/Non-Slip Base. Not Shown Chopping Bowl with Lid and Chopping Blade.